↑ Seligman, Courtney. Rotation Period and Day Length. 访问日脚2009年8月13號. ↑ 3.00 3.01 3.02 3.03 3.04 3.05 3.06 3.07 3.08 3.09 3.10 3.11 3.12 3.13 Williams, David R. (2004年11月16號). 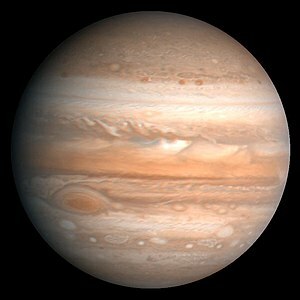 Jupiter Fact Sheet. NASA. 访问日脚2007年8月8號. ↑ Solar System Exploration: Jupiter: Facts & Figures. NASA (2008年5月7號). ↑ Astrodynamic Constants. JPL Solar System Dynamics (2009年2月27號). 访问日脚2009年8月8號. ↑ Seidelmann, P. K. (2001). Report of the IAU/IAG Working Group on Cartographic Coordinates and Rotational Elements of the Planets and Satellites: 2000. HNSKY Planetarium Program. 访问日脚2007年2月2號.